With the tourist inflow now running and the weather keeping you just warm enough, Agra has seen significant change in recent years and there’s never been a better time to visit the famed Taj Mahal. Referred to as the “City of Love’, Agra offers endless possibilities beyond Taj Mahal but to truly enjoy them – particularly if you’re a first time visitor – it’s advisable to have an experienced, professional guide as you’ll get to see far more this way than trying to do it all yourself. This is why we started offering Travel Genes Day Tours. Founded by us (the travel bloggers!) under the guidance of a very senior tour guide Raj with over 50 years of experience, Travel Genes Day Tours are private, exclusive tours of the city with a huge focus on going local. The big difference is in the personalization of the day tours – as a private tour, rather than a part of a large group, you won’t be rushed or in crowded transport; instead, your tour will be tailored to your own needs and there will be much greater flexibility. Moreover all our guides are government licensed, handpicked and well-paid (NOT complimentary guides who are only interested in earning commissions by taking you to the so-called Government handicraft shops)and we discourage the forced shopping in touristy emporiums in the names of marble factory visits. Unlike others who cut short your time in Taj Mahal so that they can take you to touristy emporiums for overpriced sale, we offer you full control over your time. Even if you wish to spend 5 hours just in Taj Mahal – your wish is our command! After all this is what you’ve come for all the way from your home. Being a traveler ourselves, we are firm believers that travelling is all about the experience and it’s in the details – the places you stay, the transport and route that gets you there, and the people you meet along the way – that makes the trip; we therefore specialize in drawing on our own extensive local knowledge and array of contacts to give our clients the very best experience possible. We don’t consider ourselves as tour agency or some tour operator. At Travel Genes there is no grand design to seek venture capital, explode in growth and sell out. With the passion we have for what we do, we are very happy – and in fact feel privileged – to be able to provide extraordinary travel experiences, and our aim is to keep it that way. Choose from traditional city tours, a walking tour of local markets or Agra Food Walk, Same Day Taj Mahal tour from New Delhi, Golden Triangle Tours or an Overnight Agra Tour Beyond Taj Mahal, or simply speak to us about your own particular needs whether they be visiting Taj Mahal in moonlight, exploring the deserted city of Fatehpur Sikri or taking a day trip to holy temples of Mathura. We will be happy to accommodate your needs. In short, we run the kind of holidays that we, as passionate travelers, like to do ourselves. When you ring our numbers, you will be directly talking to us; the travelers (instead of some sales or marketing guy) who know the region and terrain and are able to offer sound and practical advice. Our Same Day Agra Tour starts from Delhi where you will be picked up from your hotel around 6:30 am in air-conditioned, clean car and driven to Agra for roughly four hours journey. On reaching Agra, you will be meeting your guide and heading straight to Taj Mahal. You will then start exploring the wonders of Taj Mahal along with your very knowledgeable guide who will not just talk about historic dates and facts. We believe guiding is much more than talking about the dates and names of the kings like a parrot! (Anyone can know about the history and dates as it’s all written in every guide-book and all over the Google.) What our guides talk to you is about the culture and way of life. About the stories behind monuments and the traditions that still exists. And that’s the reason why our guides take more than two hours to explore Taj Mahal with you where other companies just finish off in less than 45 minutes. 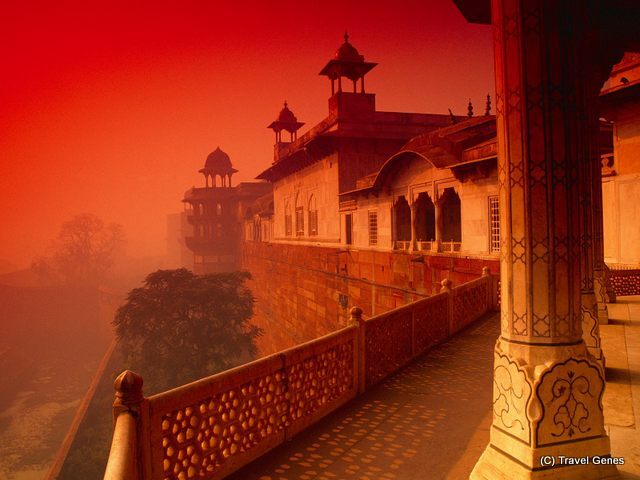 After the Taj, if you are not yet feeling hungry – you will be taken to one of the finest Mughal Fort – Agra Fort. Although much area of Agra Fort is used as Military base and not allowed to explore but still whatever is open for visitors is enough to give you the idea of the majestic Mughal rule in India. After Agra Fort, you will be taken to a local, non-touristy multi-cuisine restaurant where locals eat. We strictly avoid touristy restaurants which are usually mentioned in guidebooks and sell the overpriced imitation of traditional Indian food. Rather we will be eating out at places frequented by locals and highly popular on Trip Advisor. Here you have the choice of Vegetarian or Non-Vegetarian Buffet Lunch excluding any alcoholic drinks. After lunch if you feel like buying some souvenir or exploring the local markets – you will be taken to places with good reviews. At nowhere you will be forced to shop around and you have the choice to just skip this part of the tour any moment if you don’t feel like shopping. 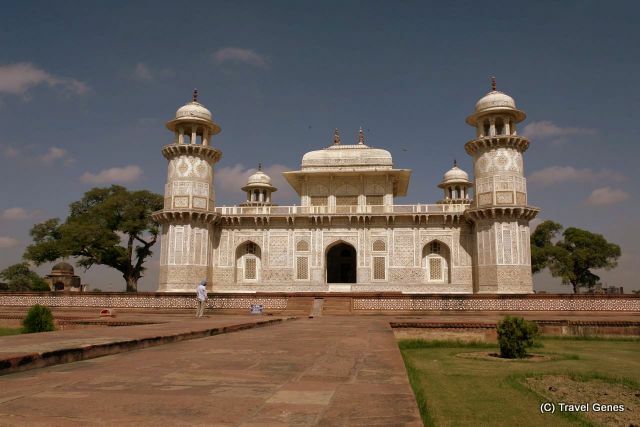 Afterwards you will head to explore Baby Taj – the beautiful monument which was built before Taj Mahal and was used as an inspiration during the construction of Taj. Or if you feel like tired of walking, you can skip Baby Taj and head to Mughal-styled Mehtabh Garden, just opposite the Taj Mahal on the other bank of river Yamuna. This ruined garden is an excellent place for sunset photos of Taj Mahal from the other side of the river. With this your day tour ends in Agra and you will be driven back to your hotel in New Delhi or Airport for your onward journey. This One Day Taj Mahal tour includes the Air-conditioned car with all toll taxes, driver’s allowance, fuel, entrance tickets to Taj Mahal, Agra Fort, Baby Taj / Mehtabh Garden, Buffet lunch at multi-cuisine popular restaurant, Guide fees, all parking and taxes. This way you can easily have the Same Day Taj Mahal tour from Delhi in comfort and style. For those of you who are unaware, we do offer Explore Agra By Mouth – Food Walk – a culinary tour of the best local safe street food where you get the chance to taste the unlimited Indian food and sweets for a small price. Also, we are running other personalized small group or private tours to Golden Triangle and lots of other places. This entry was tagged Agra, Taj Mahal, Wander Across India Tours. Bookmark the permalink. This seems a great itinerary. I checked out your “Same Day Taj Mahal Tour” details. Do you arrange tour for Indian tourists as well? Is the rate same for indians? Thank you for appreciating… We do arrange tours for Indian tourists as well. However there is a difference in rates as the monuments entrance ticket prices are lesser for Indians as compared to foreigners. Hence the overall cost of the tour is lesser for Indians due to less entrance ticket prices.